Opened in 1994 amidst a barrage of publicity, Nemesis was described as "the world's most intense ride experience", a title which it still boasts today, echoed by its consistent success in roller coaster polls worldwide. Code named Secret Weapon 3 (after the plans for 1 and 2 were discarded as impractical and not thrilling enough), Nemesis was the first coaster of its kind in Europe, with its innovative ride system allowing riders to hurtle around the track while dangling underneath it, through intense drops, turns and inversions. Though this type of rollercoaster is common today, it was only the third of its kind in the world when Nemesis was built. Located in the newly-named Forbidden Valley area of the park, alongside Thunder Looper and The New Beast, Nemesis certainly made its impact on the landscape: the ride roars around its own colossal pit, which not only allowed such an intense ride to comply with local planning restrictions, but also made for a spectacular and imposing ride area, with waterfalls cascading into its depths. 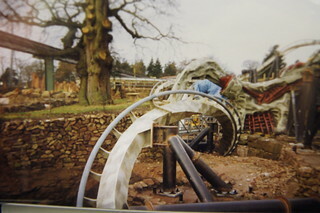 As a result, Nemesis was an instant hit with Alton Towers visitors, who rushed from all corners of the country and queued for hours in order to experience the ride, intrigued by mysterious advertisements and the ride's "legend" of an angered alien, narrated by Tom Baker. To this day, Nemesis is a firm favourite among visitors and enthusiasts from around the world, and it's easy to see why; little has changed from the day the ride opened, but years on it's just as thrilling! To prove its popularity, Nemesis was crowned "King of the Coasters" in August 2011, following an eight week public poll at the Resort - and online - to find out which of the park's roller coasters (between Nemesis, Oblivion, Air, Th13teen and Rita) was the true guest favourite. Nemesis emerged victorious with 41% of the votes, while Oblivion came second with a mere 21%. A true testament that Nemesis is not just an enthusiast favourite, but captures the hearts and pulse rates of many of its riders.